History is marked by "flowering" time periods, a confluence of time, location and people that melds in a dynamism that creates something interesting and different. (Some of these periods have enormous influence on world history, Paris in the 19th century springs to mind; a center of radicalism in mid-century, a center of frenetic artistic bounty in the late century.) 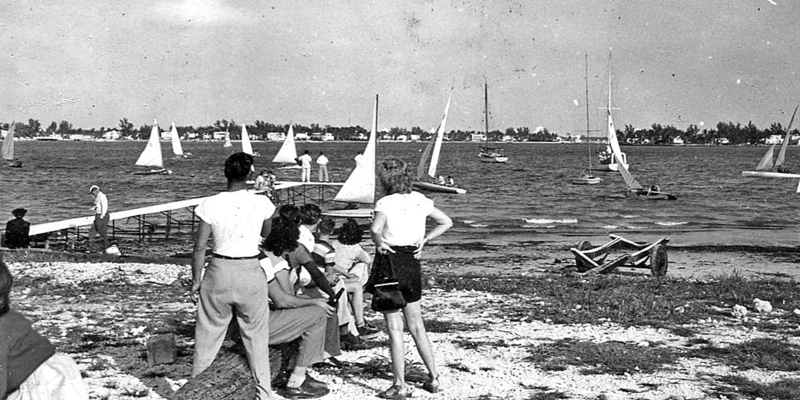 Such was the case with small boat sailing out of Miami during the post-WWII years. A combination of professional builders and amateur tinkerers pushed the development of three small boat classes, two of them local. 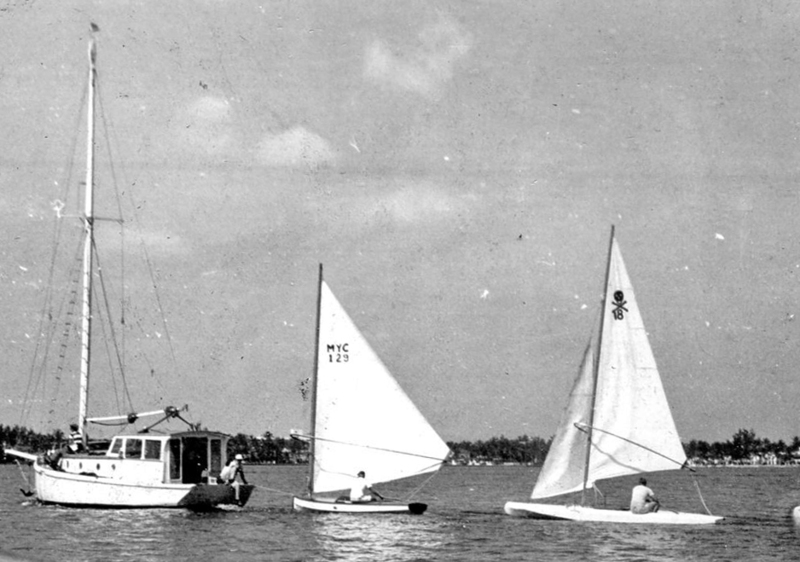 However, in this history, the two local Miami classes, the Suicide and the Cricket, "flowered" and then disappeared, their effect negligible on the later history of small boat sailing . The long, lean, Suicide dinghy with the wishbone rig was the fastest sailing class in the U.S immediately after WWII. The Cricket was an all-out racing cat-boat with a wishbone rig and a sliding seat. (The Mothboat was the third class - what we call the Classic Moth today.) 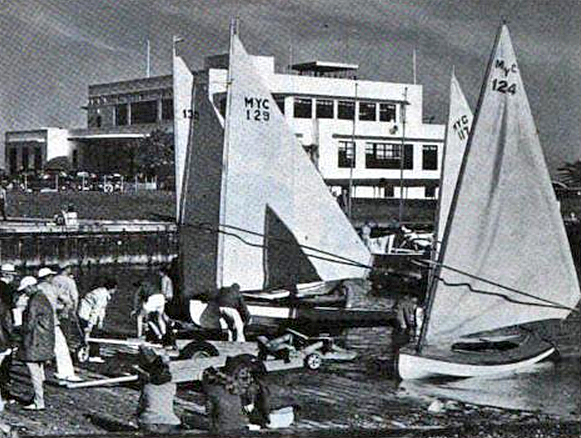 Miami Yacht Club on the causeway was the focal point for racing these unique craft. In search of more archival material on the Suicide and Cricket class in Miami, I turned to George A of Mid-Atlantic Musings. 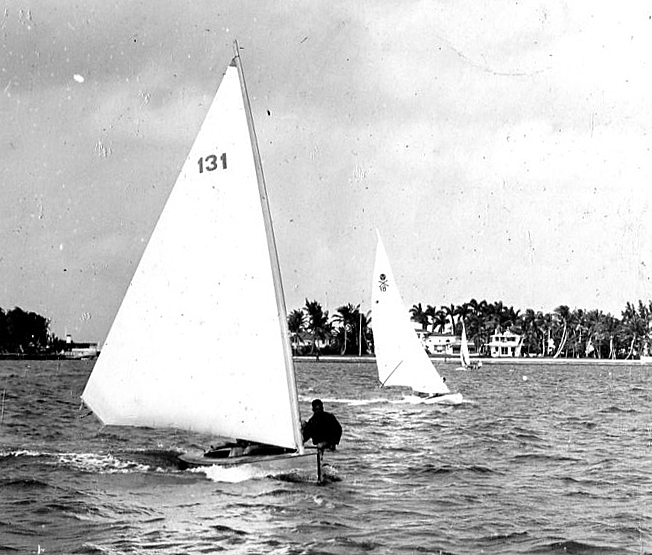 George has a vast collection of Mothboat historical material including the Miami period. Sure enough, George was able to produce the Walter Dietel album. Walter was a German immigrant who designed and built his own Mothboats and Suicides in Miami after WWII. Photos from the album are featured below. 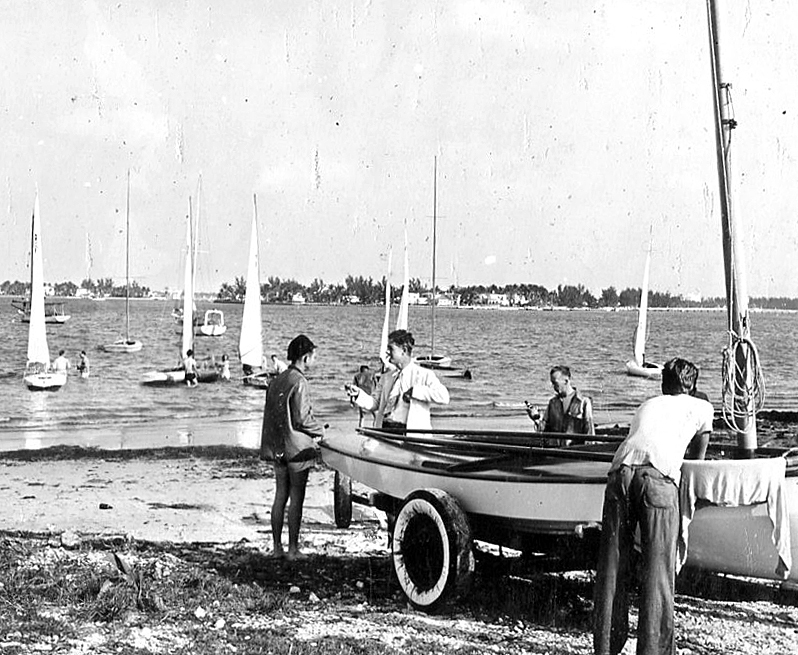 Some of the photos are from the Miami Y.C and some, I think, are from the Coconut Grove Sailing Club. A Cricket coming at the camera with a Suicide in the background. A Cricket on a trailer with Mothboats launching. Three Crickets. This may be a start, or possibly a leeward rounding - hard to tell. You can definitely see the sliding seat in use on the leftmost Cricket. Jerry Gwynn's champion Suicide Joker. A Suicide kicking it up on a reach. 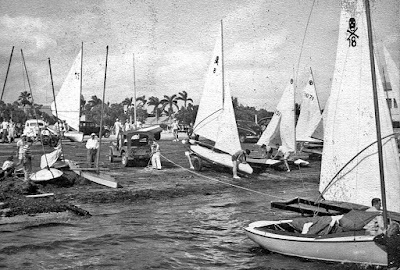 On the launching beach, a mixture of Suicides, Crickets, Mothboats and what looks to be a Whitman EZ-build chine decked canoe (International Canoe) with most likely Lou Whitman himself standing over it. The peanut gallery, in rapt attention to the racing, consigned to a log on the beach, . 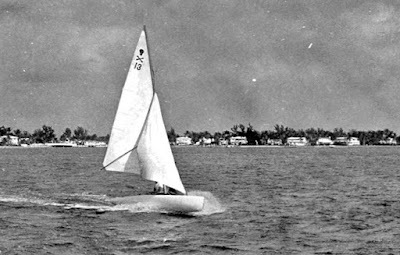 Walter Dietel, from whose photo album these images were taken, with his home-built, amateur designed Mothboat. Lots of parents (especially, it seems, the Dads) take their kids out on their small singlehanded dinghies. The kids quickly discover that their comfort is secondary as they hang on, or get plopped into a corner, or sat on. In this video it appears the father needs all of the Sunfish cockpit for himself. His daughter is to fend for herself on the deck, hanging onto the splash rail. Given her grins, this precariousness only seems to heighten her enjoyment. In this video of a father/son sailing a Europe Dinghy, our little tyke, Benjamin, must do an intricate dance with Dad on every tack. Tacks are at the 1:30, 3:31, 4:30, 8:26, 11:35, and 16:17 mark in the video. Despite getting rolled over by Dad on every tack, our stoic Benjamin seems to warm up to the sail after a while. 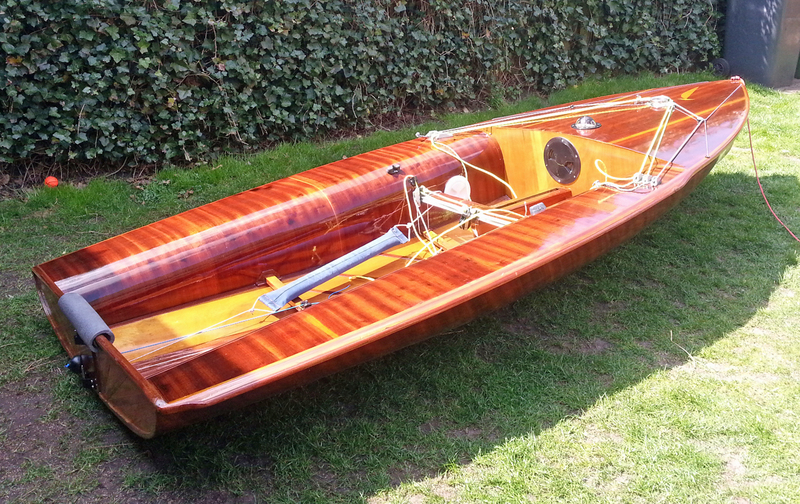 The designer of the Europe Dinghy, Belgian Alois Roland, originally built them in wood. When Roland's company went bankrupt, his assistant, Giuseppe Christalli continued building beautiful wood Europe dinghies. 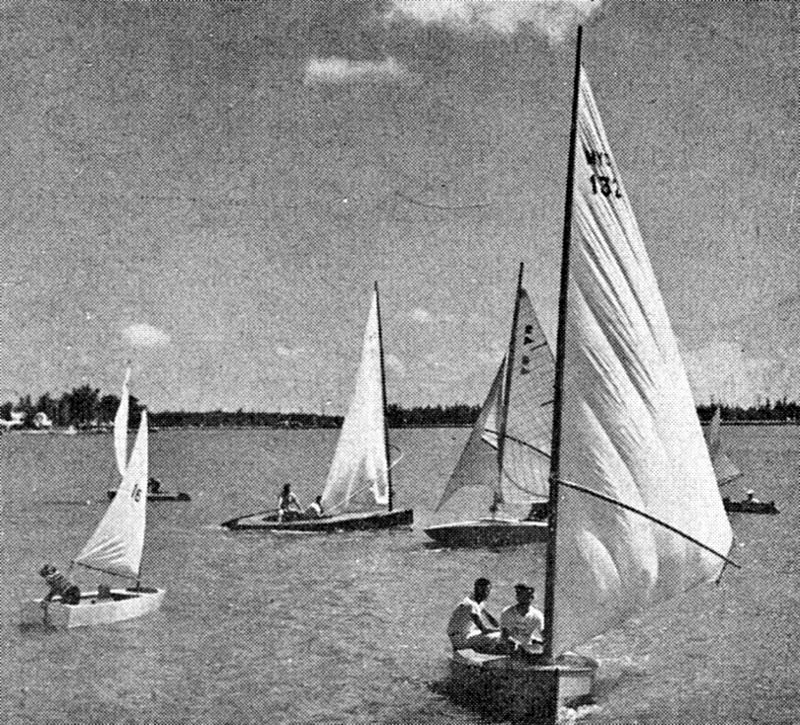 When the Europe Dinghy class went Olympic the wood boats were no longer competitive and the class became plastic and has remained one where the new boats are entirely made out of glass. History of the Europe Dinghy from Classic Classes by Vanessa Bird. My Dutch friend, René de la Rie, sent along photos of his stunning wooden Europe which is not a Roland or Christalli but a Tebberman. Tebberman was known primarily for his rudders and centerboards, and only built a few Europe Dinghies, but what lookers his Europe Dinghies were! Beautiful deep mahoganies were matched with contrasting lighter inlays to create masterpieces. 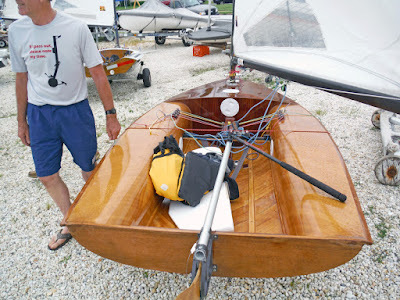 George A of Mid-Atlantic Musings also owns a Galetti woodie Europe. Whilst not as stunning as a Tebberman the Galetti hull is still very pretty. Galetti was an Italian builder on the southern shore of Lake Garda. He was more famous for his 505's and Quarter Tonners. 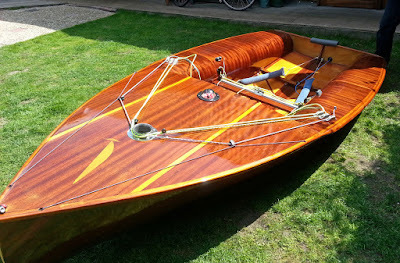 Over at his blog George A tries to identify the builder of his "woodie" Europe dinghy. 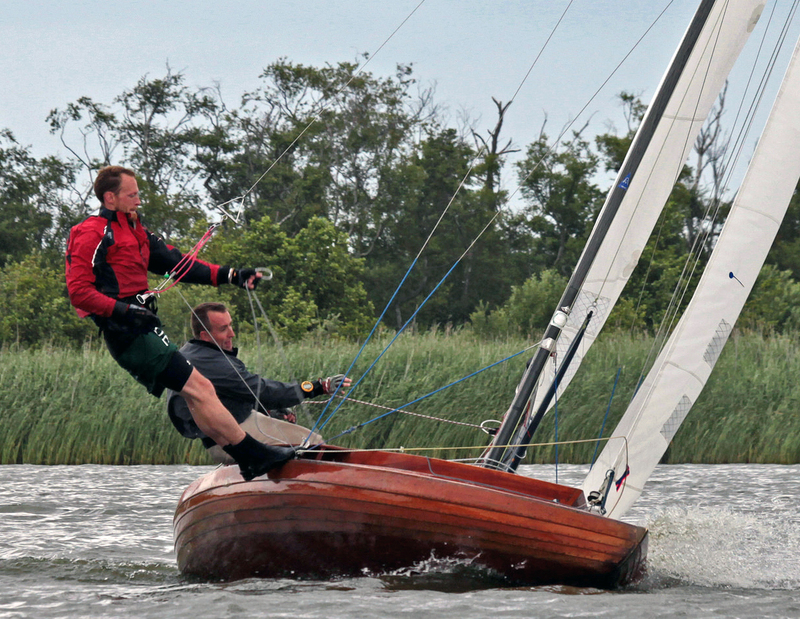 George unveiled his woodie Europe with a new Bosquet foredeck at this year's Brigantine regatta. Redecking a glass Europe hull. I have owned several Classic Moths, a scow Moth, and yes, even a narrow skiff Moth. The narrow skiff Moth was a Magnum 2 built by John Claridge and originally sailed at the 1976 Moth Worlds by the builder. 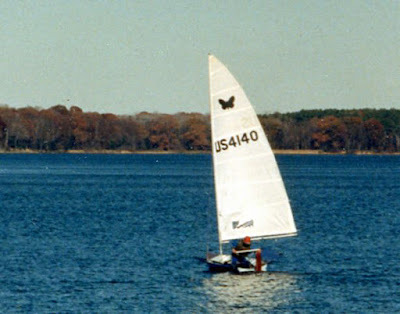 The Worlds were held at Ware River, Virginia and John sold the Magnum to one of the local Moth sailors after the regatta. I rescued the Magnum from the Old Dominion University boat house in Norfolk sometime in the mid 80's and getting it back on the water became a joint project with Bill Beaver. 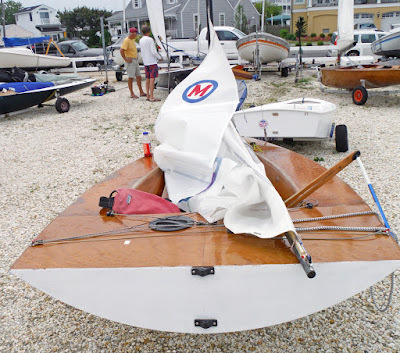 By the time we finally got sailing, it became obvious the very lightweight hull of the Magnum 2 was creaky and leaky. I never did fully trust hiking off the wings. I think we eventually gave the Moth away. Bill Beaver went on to build two more narrow beam Moths to his own design and then did his own foiler project. I, on the other hand, migrated to the more sedate side of Mothing with a scow and then eventually the Classic versions. 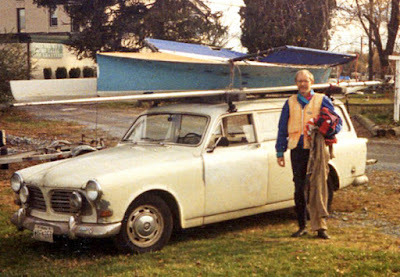 The original wooden Claridge Magnum II on top of Bill Beaver's Volvo 122 at West River S.C. As always, Tweezerman (back when he still had some hair) in his natty sailing gear. 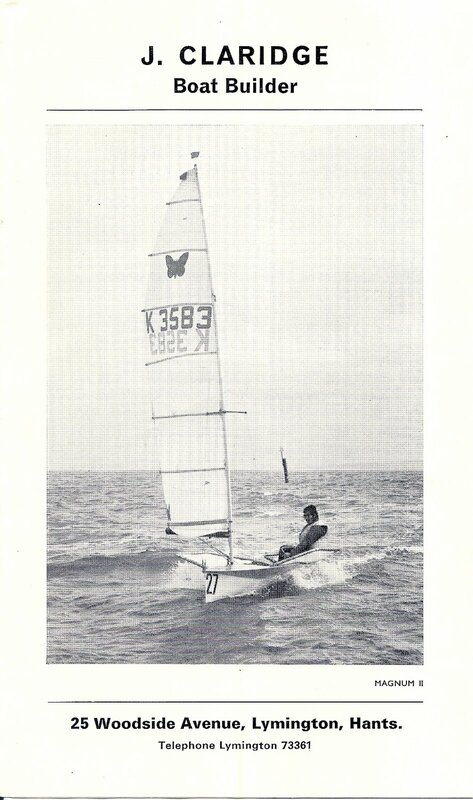 The original Claridge ad featuring the builder sailing his Magnum 2 that ended up in our hands. I wrote this short piece, about my first sailing experience in the Magnum 2, for an Australian Moth newsletter. It still cracks me up whenever I read it. 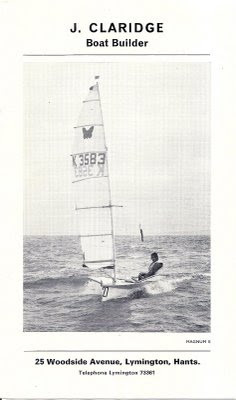 Last fall (November 1987) I threw my Magnum 2 together for the first time in order to make the end-of-year handicap race at Severn Sailing Association. I was tying the last pieces on at the last minute (those who know me can picture the rigging job!) and I just barely made it to the start but to no avail. There was no wind and, at the end of the day, I felt like I had tried riding an unicycle. After starting with the Snipes, Daysailors and Lasers, I moved forward in the Moth to reduce wetted surface and this set up a chain reaction not unlike the swinging pendulum of a clock, though with a much faster period of movement. First the leeward wing dipped into the water as a small ripple of a wave sent the Moth lurching. To counteract, I moved my torso slowly to weather, cognizant that this was a tender craft - little did I know how tender! Immediately the Moth lurched the other way , dipping the weather wing in the water. I reacted by adjusting my weight with even more care but the Moth seemed to consider that, even this deliberate movement, was much-too-much and flopped back, dipping the leeward wing in the water. This was repeated several times and, with all this awkward flapping of wings, my amused fellow competitors thought that this aquatic Moth was attempting to take flight. In desperation I moved to the stern where there was more boat and things settled out. Phew! Now I had time to look around and it wasn't pretty. 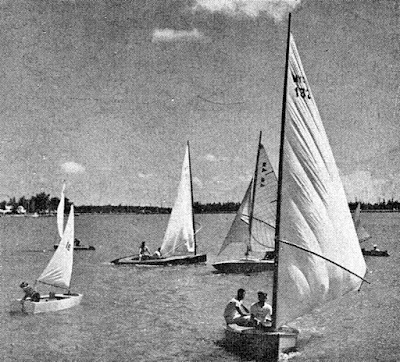 Ultralight dinghies possess no momentum and, in a glassy calm and, with every passing motor boat wake, the Moth would slowly be pushed backward. What looked to be my competitors amazing speed away from me was, instead, my amazing speed backwards. To compound this comedy my cockpit had filled with water (remember this is a twelve-year old Magnum 2 and at the time it did not have a full double bottom - it does now!) The episode of wing flapping had alternatively scooped water on the wing covers that then ran down to the deck of the Moth and filled the center cockpit well. I hadn't realized that there were two small drain holes from the center well to the forward double bottom; hence there were no plugs in them and I was SINKING! Not to worry. I had made, at the most, 100 yards from the clubhouse docks, of which 50 had been lost in a magnificent display of wing -flapping and reverse sailing. The remaining 50 yards to safety was made by sculling and hand paddling. "To sail in the beautiful long sunsets we have here in Sweden this time of the year is just marvelous. Martin also sent along this spectacular sunset photo. Martin has also put together a stunning slideshow of his photos taken during the 2013 Tjörn Runt. Nothing wrong with foot-tapping electronica every once in a while. NOEP is an Estonian musician. Mistral Y2K Section Offsets, Via John Z.
I mentioned when I published the offsets for the Mistral hull panels that you still needed some bulkheads to bend the panels around. John Z. immediately shot me, via email, the section dimensions he measured off his very fast Y2K Mistral. They are taken every 305mm to give an even 11 sections over the length of the hull. (Station 3353 being the transom, sitting on the aft end of the hull panels). John used every other section inserted in his panels when he bent them up to set up the hull shape. It must be noted that 3 bulkheads are left in the hull before decking and two of them don't exactly lie on station spacing given (the forward edge of the aft deck being the exception, it usually aligns with Station 2743.). 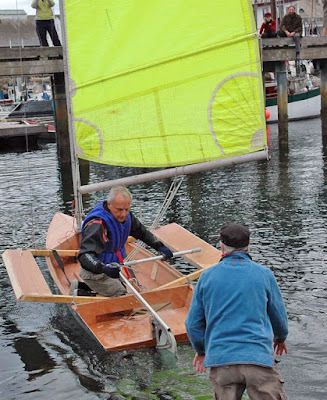 Get a small two-man dinghy with, and this is important, NO SPINNAKER! Enjoy whatever the competition brings! The previous header photo was of the Norfolk Punt, a racing dinghy class found on the Norfolk Broads, England and derived from the bird gunning punts that were in use there in the late 1890's, early 1900's. 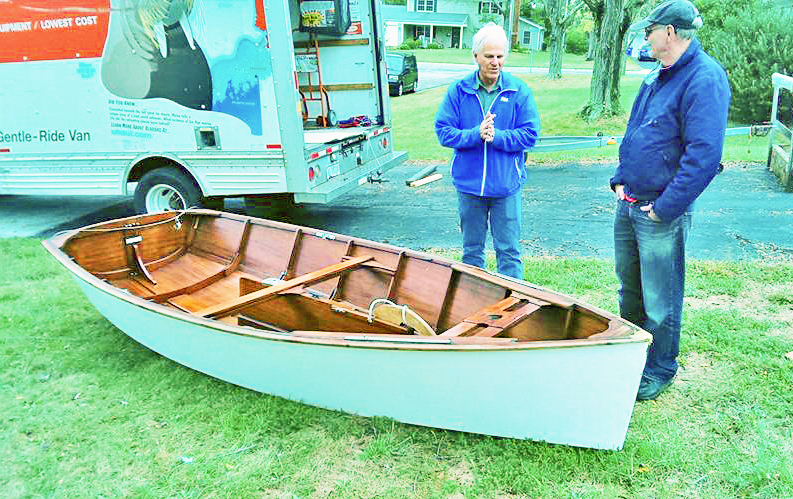 The Norfolk Punts are 22' long, double-ended and like the International Canoe, the modern boats have no resemblance to their heritage except for the canoe stern. 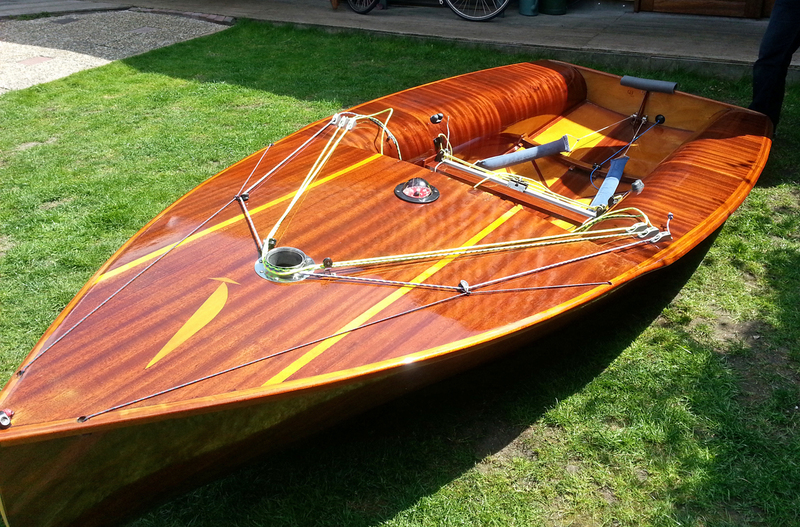 The Norfolk Punts of today are very much a modern racing dinghy with double trapezes, assymetrics, and a tall, overpowering sailplan. Although the modern class is a development class there does seem to be a good mix of vintage punts racing though I have no idea how they handicap Punts with hulls from 1935 versus a punt designed in the last ten years. The Punt featured in the header photo looks like a 1960's Wyche and Coppock single chine design. 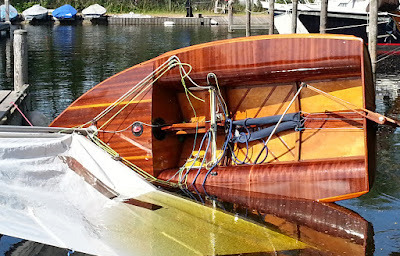 The photo of the Norfolk Punt below gives a good idea of what the original sailing Punt looked like; reverse sheer, decks sloping outward, high coamings. With this Punt you can see the gunning punt lineage. This Punt looks short so it may be a reproduction. Here is a modernized 1930's Punt hull with carbon rig and trapeze. It retains the reverse sheer and high coamings. A video of a modern double trapeze Punt with the video also ending with a modern double trapeze teabag capsize. Despite being the tippiest Classic Moth design out there, more Mistral designs are built in the U.S than any other design - by a long shot. Although a competent Laser or Sunfish racer has no problem handling a Mistral (after an initial "let's get acquainted session" to get over the wobbliness) other, less experienced sailors, get sucked in by the simple stitch and glue, bend-em-up, building process. Sometimes they have been very surprised when they get on the water. More information on the Mistral design can be found here. The front end of a Mistral - this is Mike Parson's. The back end of a Mistral - this is John Z's. For those not to be dissuaded by my introductory warning and desire to build a Mistral, here are the Mistral panel offsets in both DXF and PDF formats. The section dimensions of the fast Y2K Mistral can be found here. A DXF drawing of the hull panel (you will need 2 identical panels to form a hull). Use the pop-out icon (top-right) to open in another tab to print or download. A PDF file with the offsets. Use the pop-out icon (top-right) to open in another tab to print or download. A short synopsis of Derek Chester's original instructions for the Mistral build. Again, use the pop-out icon (top-right) to open in another tab to print or download. What makes this blog run? 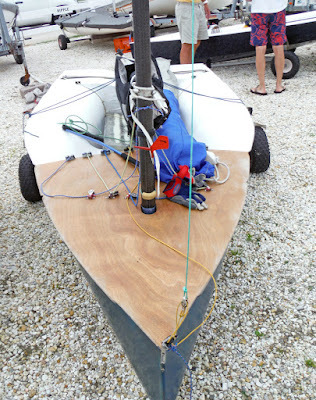 Edensaw Boatbuilding Competition: A Sailing Dinghy Wins! Here are two of the boats on the beach after the time-limit for boatbuilding expired, ending all construction. 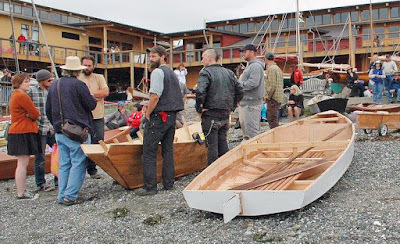 On the left was a dory built only with hand tools. On the right is a 14 foot, V-sectioned sailing dinghy designed by sometime Classic Mothist, Stephen Ditmore. As the photo reveals, Ditmore's team got the hull done over the weekend but the decking and rigging awaits. 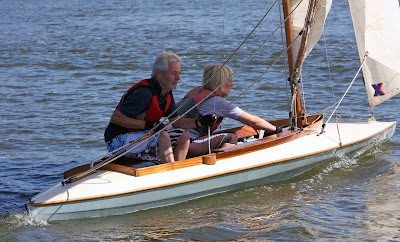 Winner of the competition, designer Richard Woods on board at the initial push-off of his Zest dinghy. This is definitely a racing singlehander with hiking wings. (The hull is a relatively narrow, flat bottom shape.) The hull was completed by the team over the weekend and Richard was able to scavenge sailing parts from some of his other projects to get this design sailing in short order. I think the pushee in the photo is Michael Scott who owns several sailing dinghies including a couple of Classic International 14's and who is constantly feeding news tidbits to the blogmeister. Instead of painting over the freshly applied epoxy, the Richard Woods team decided to apply a silver vinyl decal material over the hull (purchased at an auto supply store). Very distinctive, hence the boat's name Silver Bullet. Designer of the other sailing dinghy at the competition, Stephen Ditmore sailing his Classic Moth design. Unfortunately we have only seen his Moth show up once at Brigantine, New Jersey. The wrap up video from the Edensaw competition. 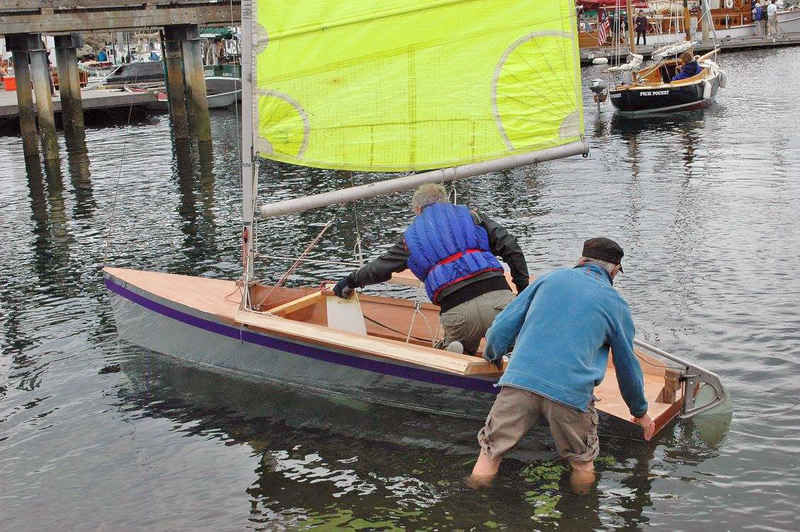 Third Annual Edensaw Wooden Boat Building Challenge! from Al Bergstein on Vimeo. 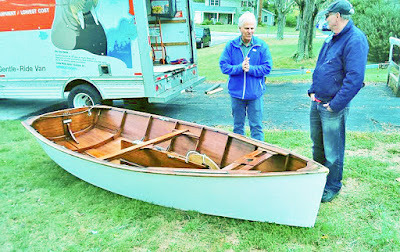 I went over last weekend to help George A. of Mid-Atlantic Musings> move one of his boat collection into a U-Haul. It wasn't a Moth but a Penguin and was being collected by her new owner. George's Penguin dinghy was one of six originally built in the 1960's by a guy named John Walton in Brigantine, New Jersey. This Penguin, most likely being the sole survivor of the six, was being rightfully reclaimed as a family heirloom by John's son Bill, who had flown up from Texas. 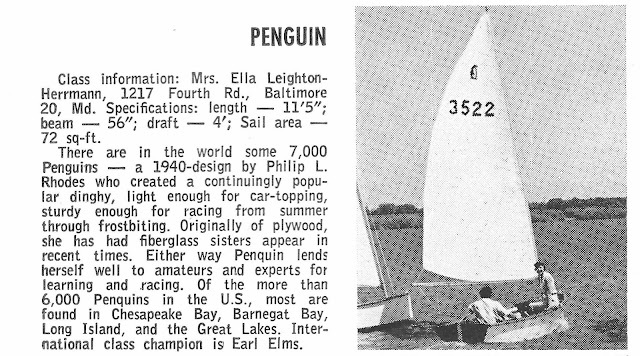 And from the 1960's, here is the blurb on the Penguin from the magazine One Design and Offshore Sailing annual small class review, . Some other posts about the Penguin dinghy. At this year's Classic Moth Nationals we had a marine layer settle in Saturday night, giving us fog on Sunday morning, a rare event for Elizabeth City, North Carolina. The fog started to creep out towards Pamilco Sound around 9 a.m. and racing commenced, on time, in sunshine. I took a couple of photos. The fog didn't stop the sailors kibitzing about Mothboats. Two transoms in the mist. 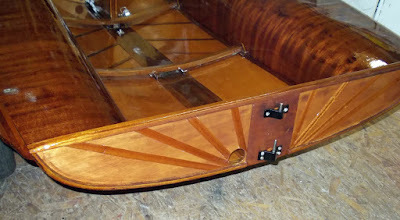 The Laser transom of the Maser and the wide Europe Dinghy style transom of the Mousetrap Mistral. The view from the Pugh's pier. The original post of the 2015 Classic Moth Nationals can be found here. Music Whenever; Indigo Girls "Closer to Fine"
When you look on the InterWebs for the top 100 folk songs of all time you generally won't find the Indigo Girls "Closer to Fine". However, for me, that song makes it into the top ten of all-time folk songs. The Florida Cricket Class - A Missing Link? 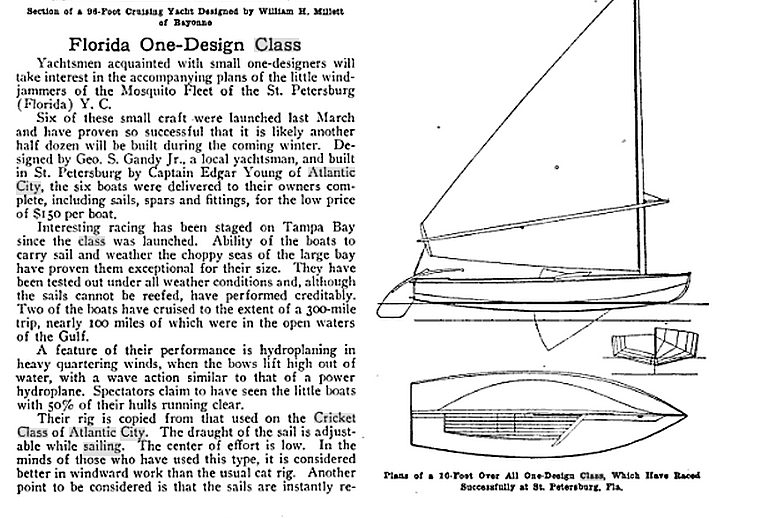 The Cricket class was a 15 foot, chined, V-shaped, catboat with sprit rig and club clew. The class died out in the early 1960's. 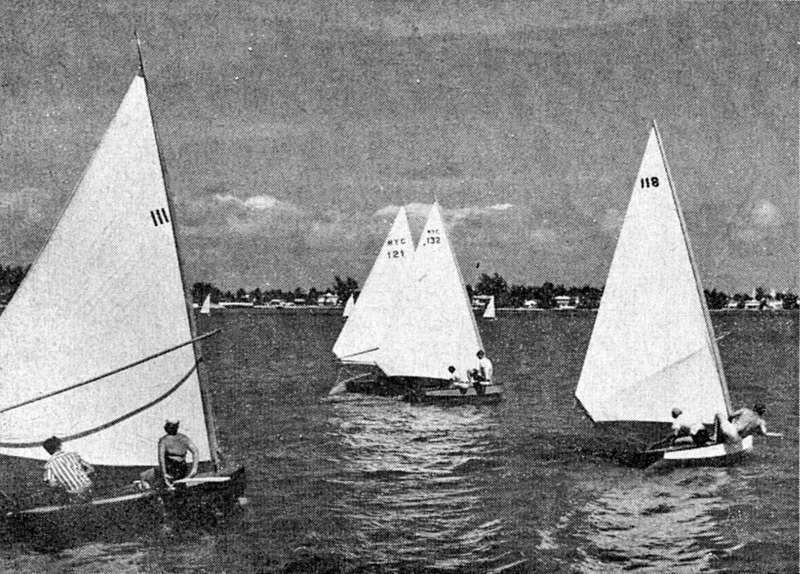 By that time the Cricket fleet was only found at the Miami Yacht Club and, given the small numbers at the demise, it is today, a forgotten class. 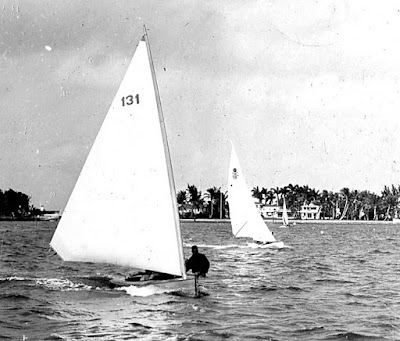 But in digging through U.S. sailing history more comes out about the Cricket. The Cricket class was designed sometime during the 1890's, in or around Atlantic City N.J, where it became extremely popular. Reports indicate hundreds were built and about one hundred were racing out of Atlantic City in 1900. 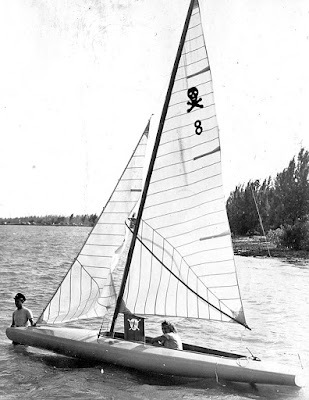 It was, as far as I can determine, the earliest example of a chined, V-shaped sailing dinghy in the United States. More about the early development of the Cricket class (who was the designer? what prompted the design? when did the class die out in Atlantic City?) has been hard to come by. 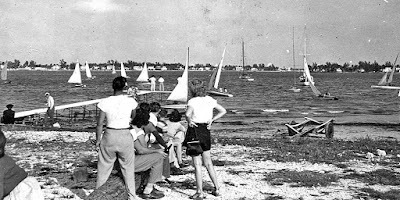 In the 1920's, when Northerners began to flock to the remote, but bucolic winter paradise that was Florida, the Cricket class was also exported in numbers from the New Jersey shores. It was reported that twenty five Crickets were shipped to southern Florida with most of them destroyed in the hurricane of 1926. 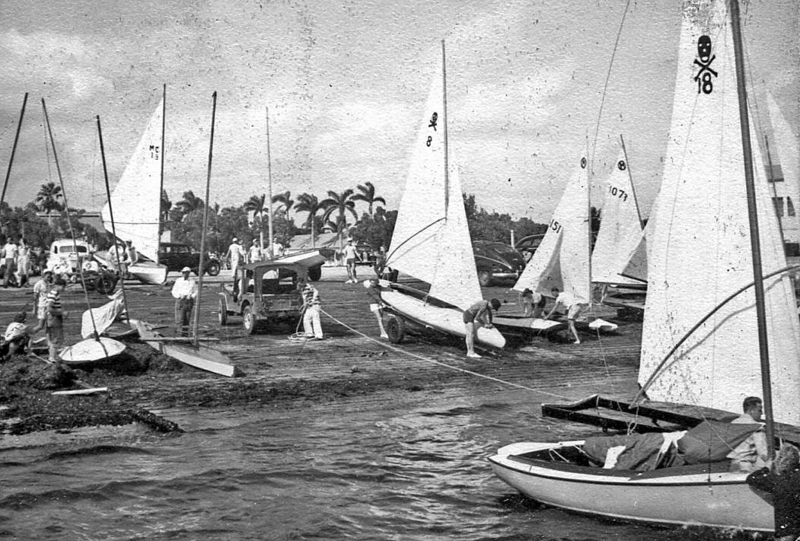 The Cricket class would rebuild in Miami and would form the core of the Southern Florida Sailing Association (later the Miami Yacht Club) when it was organized in 1928. The Cricket would become the boat to beat in the free-for-all under 150 sq. 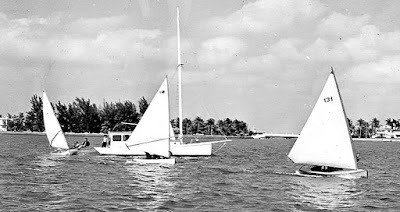 foot (sail area) class. When, in 1931, Bill Crosby designed the Snipe for the Florida West Coast Racing Association's free-for-all Trailer class, he must have been mindful that his Snipe would initially be compared against the Cricket class, at least in Florida. Between the two, the hull design similarities are striking. It does seem that Crosby started designing his Snipe using the Cricket as a baseline and then added user-friendly features (a sloop rig with a high boom being the most notable one). The Snipe went on to international fame, the Cricket, to oblivion. A smattering of classic Florida sailing dinghies; on the left, the Optimist Pram, behind the Pram, a Mothboat, in the center, a Cricket, with the other Cricket, bow on, in the foreground. Behind the Cricket is a Suicide class. Crickets launching at Miami Yacht Club, late 1950's. Crickets going upwind. In all three of the ones in view in this photo the crew are hiking using skinny hiking boards. 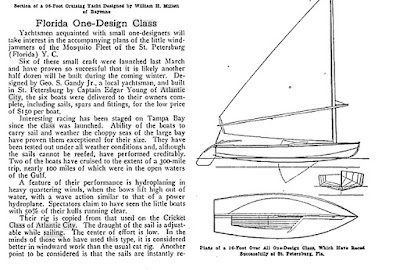 The closest we have to a set of lines for the Cricket was this one-design commissioned by St. Petersburg Yacht Club as featured in The Rudder, 1919. The lines look very close to a copy of the Cricket although the length for this one-design is a foot longer than the Cricket. A blog post about an earlier New Jersey dinghy, the Philadelphia Tuckups of the 1870's can be found here. This is one project of the super-rich where the beauty just radiates outward into one colossal superlative and, even if you are to the left of the political spectrum, all you can say is, "Well done, well done!" LES VOILES DE SAINT-TROPEZ 2015 - DAY 3 : C'est bon ! from GMR+G1 on Vimeo. My post on the resurgence of the J-class can be found here. Is it me, but doesn't one of the professional sailors look a lot like Otto (Kevin Kline) from a "Fish called Wanda"